"With this stylish, versatile product, boat shoes turn to jungle boots instantly! Rubber sandals become stiletto pumps! Loafers turn to cowboy boots! 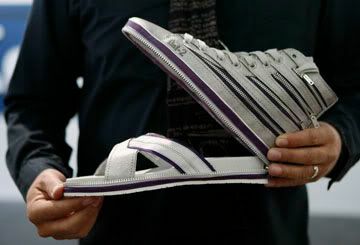 Thanks to 40 pounds of zippers embedded in the design, you now only need ONE pair of shoes, for life!" That's so weird! How about taking off your shoes when you come to a beach? What? Am I seeing right. Pfft, taking off your shoes? That'd be too easy!